It was a bittersweet weekend for Justin Leov. For a number of months now he has been preparing to announce that this season will be his last on the World Cup DH circuit. 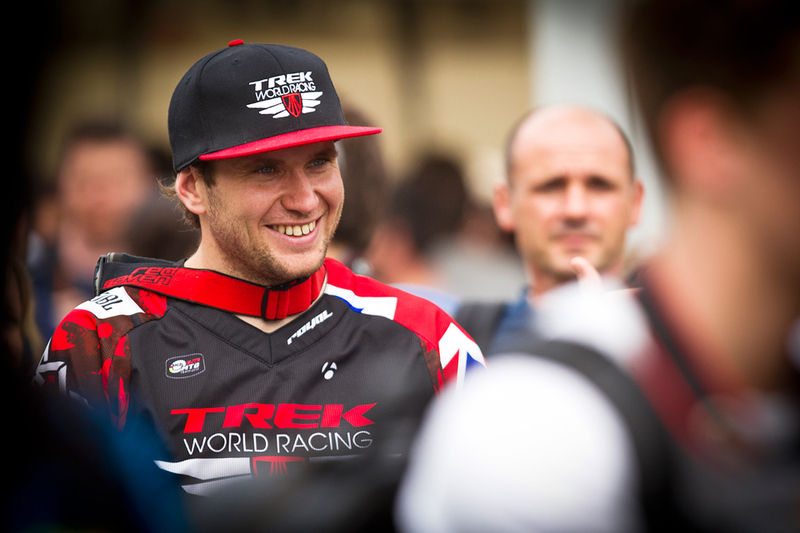 It's his 10th season and his career includes many highlights including three World Cup podiums, winning some US national events, Crankworx Garbanzo, and importantly having a major impact on the careers of Aaron Gwin and his compatriots Sam Blenkinsop, Cam Cole and Brook MacDonald. Justin said: "I've given this a lot of thought and for me there's no question that this is the time to announce my retirement. The sport has given me a great 10 years, and these last four with Trek World Racing have been the real highlight. There are other things for me to do and both my wife Tory and I are looking forward to the future. I'll be giving it my all for the next races and aiming for the best results possible. I'll always be a super competitive and committed person but for now it’s time to turn these traits to another life." In his last practice run before the final Justin smashed a tree with his left hand and raced the final with a suspected broken finger. The damage was evident but X-rays later confirmed he escaped serious injury and is off to Highland Park, NH, next week to race. Team Director Martin Whiteley said: "While I've known for some time that this will be Justin's last year on the circuit, the public confirmation of it doesn't come any easier. Justin is an integral member of the team, a hugely talented rider, and an amazing mate and teammate. We will savour every week we have with him for the remainder of this year and then wish him well in his new chapter in life. We are truly indebted to Justin and all he has given us, the team and this sport." In front of the partial home crowd and a large contingent from the Gwin family, Trek World Racing's Aaron Gwin took his fourth World Cup win of the season, and a career ninth, when he bested the rest of the world class field here in Windham, New York. Drowned out by chants of U-S-A, U-S-A, Aaron battled to find the words to describe the feeling of winning in front of his American fans. Aaron said: "Whether I won or lost today I knew the fans would have my back and be supportive of my racing, but there's no doubt that the win here feels very special. You can hear the fans all the way down and it pushes you on. I actually took the chairlift quite late today and it allowed me to see what times the top guys were posting and I knew I'd have to be on it to win. I made a mistake early on where I hit three course marking poles and I know I lost time in the first sector but I was trying to stay cool and keep the pace right to the line. Walking out onto the podium here with the US flag here means a great deal to me." Neko Mulally made a solid return to racing after his nasty crash last weekend in Canada, scoring a 36th place which he was happy with and giving him the confidence that he's getting back on track after the recent setbacks.